Today starts the August stamp release at Craftin Desert Divas and I have the honor of being a guest designer!! We have four new stamp sets in this release. Day 4 sneak peeks are going to be a larger 5x7 stamp set! These images and sentiments will also come with a matching SVG cut file that is FREE to you . There are a few specials during this release we want to share with you. Every purchase receives a FREE Too Cute by Jessica SVG pattern made especially for this release. Any minimum 2 Stamp purchase will receive a FREE mini stamp. Both stamp & pattern will be revealed during the hop. Also there will be a sale 20% off your ENTIRE purchase using code: August starting on Saturday. The free mini stamp & sale will end Aug. 31, 2014. Welcome to Day 1 of Craftin Desert Divas August stamp release! Each day we will be giving you a sneak peek at one of the four new stamp sets. Then, on Saturday and Sunday, we will have a blog hop with prizes each day. There are some amazing creations being shared today during this stamp release. We also have some special guest designers who will be joining us. 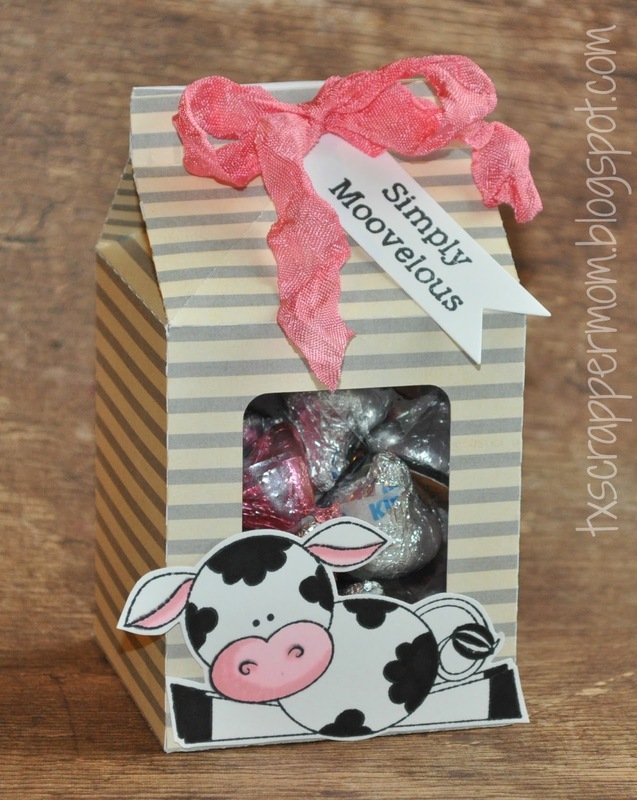 Today we are showcasing the Simply Moovelous stamp set. We have (3) 4x6 and (1) 5x7 stamp sets. Stamps will be available to order on Saturday. We hope you will stop by the Craftin Desert Divas Shop and the Craftin Desert Divas Gallery Facebook group. We would love for you to join us and share your creations with us using Craftin Desert Diva's stamps. In this group we first show previews, have giveaways and much more! All You have to do is leave a comment on each of our blogs! You are NOT required to comment on EVERY SINGLE blog, but the more you comment on, the better chance you have for winning! Thank you all so much for joining us today and I hope you will come back tomorrow for more sneak peeks. Roberta, this is so sweet! I love it! Wonderful! I just love the little cow! Super cute and the sentiment is so darn sweet! What a sweet idea! Cute box and extra cute cow. Great job! Great project. Love your coloring on that precious moo cow. Adorable milk carton. Love the sentiment and pink crinkle ribbon! So very very adorable. Love this. This is such a sweet treat box. Thank you so much for joining us as a guest designer this month at Craftin Desert Diva's. Thank you so much for sharing this awesome treat box! The cow is adorable! What a great treat container! Thanks for being Guest Designer for this sneak peek! Thank you so much for joining us, you did a fabulous job! Adorable. I love the way the cow looks like she's guarding the chocolate. Like the treat container. Cannot go wrong with Hershey chocolates. This is so adorable! I love how you colored your cow! Very cute treat container and the cow is just adorable! Thanks for joining us over at Craftin Desert Diva's as our guest designer! Love this project!! Your cow is just adorable and love the milk carton box!!! You created a super cute, adorable project !!! I love this !!! So adorable love the cow..